Five card draw poker is one of the oldest forms of poker and is one of the most basic games to play. The object of the game is to make the best hand possible from the cards that are dealt after the first draw. The betting now takes place and the player that has the best hand after the second round of betting is the winner and takes the pot. You can also improve your skills in this poker college. The first means of play is the original version of the game. This manner of play is played around the world. Each player must deposit a predetermined amount of money into the pot. This money is called the “ante”. This has to be done before any cards are dealt. The second method of play is called the “blind”. When a blind game is played, there is no ante. The two players immediately to the left of the dealer must deposit blinds before play commences and any cards are dealt. There are two types of blind that must be paid before each game. These are known as the small blind and the big blind. The amount of the blind may be predetermined. 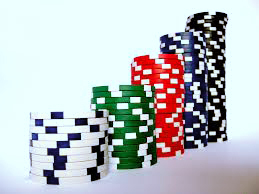 The first player to the left of the dealer pays the small blind and the player to his left pays the big blind. The big blind is always double the amount of the small blind. After the ante or blinds have been paid the dealer then deals each player five cards face down on the table. The betting now begins. Bets are placed by assessing the strength of the hand. All players that have not folded enter the draw. In this round each player can opt to change as many cards from his hand up to a maximum of five. A player that elects not to draw any cards is said to “stand pat”. When all players have been dealt their replacement cards they must again assess the strength of their hand. All players that have not folded make a second and final bet. Following the second betting round it is time for the showdown. All players that are still in the game reveal their hands. The strongest had shown is the winning hand. Study the body language of the other players and watch their reactions to the hands that they are dealt. This will give an insight into the strength of the cards they have been dealt.